"The fight is not really with your opponent, it's with you." Much like Hoop Dreams, which surveyed the dreams, struggles, successes and failures of two inner city basketball players in Chicago, On The Ropes follows the "ring dreams" of two young Brooklyn men and one woman in real time (at the expense of the crew's lives), and the man who tries to keep everything together—their trainer, Harry Keit. 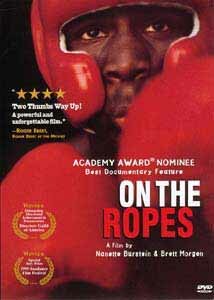 Unlike the former, which failed to be recognized by the Academy despite Siskel and Ebert's benevolence, On The Ropes was nominated for an Academy Award® for Best Documentary Feature. Tyrene Mansen's life is the story of all that an underdog can be who doesn't make it, while George Walton's is representative of every dream a young urban boy on the brink of doom dreams. Noel is the one in the middle, straddling the line between two worlds. Harry Keit is the North Carolina born trainer, helping these kids for a chance to redeem some untold story in his earlier life as homeless crack addict. George is the most talented of them all, with the most upside in terms of long-term career. But success gets to George's head, and he drops Harry and changes over to another "more professional" outfit. You see, George wants to be paid. Simple. Despite that he becomes a self-centered jerk, it's impossible not to feel George's pain as he learns a lesson from his greed. Noel is the young man with raw talent, not sure enough of himself and riding the line between possibility and what could have been. The son of a man who died of AIDS, Noel is that bad student who doesn't feel himself worthwhile of Harry's efforts. The centerpiece of the film is Tyrene, a most promising female boxer living with her crackhead brother whose riffraff friends come in and out of her house exposing her children to drugs and crime. When the police raid the house she is arrested in possession of crack cocaine, and we follow her trial through to verdict. The film actually got its roots in award-winning co-director Nanette Burstein's desire to learn how to box, which landed her at this boxing ring. Here she met Harry, who is the heart and soul of the film. Harry is there when Noel doesn't go to school, or is ready to give up on himself, to pick him up and guide him back to the straight. When George has nowhere else to turn, despite the pain George caused him, he takes him back in. When Tyrene is arrested, Harry is there to make her believe that all will be well. Harry is the glue, the axis by which all these young people turn. A finer example is hard to find. "Pulling himself out of the gutter by his bootstraps is Herculean," says co-director Brett Morgan. Image Transfer Review: The bit rates are all over the map on this transfer, sitting mostly in the 4-6Mbps range, but then blipping up into the 7-8+ Mbps zone—and occasionally higher. Blacks are generally good, but on several occasions are slightly gray in scale. There is evidence of edge enhancement in the guise of haloing, and at times there are pluming whites. Still, the colors are generally strong and skin tones natural. Grain is evident often, but one has to think that the source material for this transfer wasn't up to Hollywood standards given the nature of documentary budgets. However, the quality of the content supercedes the image transfer. Audio Transfer Review: There isn't much to talk about here. Outside of some minor, unexciting surround sound for the hiphop aspects of the musical score by Theodore Shapiro, this is essentially a layman's Dolby Surround 2.0 soundtrack. The dialogue, which is solidly centered, is mostly understandable. Extras Review: Although the scene access is minimal (8 cues only), the disc contains a couple of nice supplements. Besides the trailer and cast and crew bios, included are the epilogue of the film (with a interesting twist) and the entertaining feature-length commentary with co-directors Nanette Burstein and Brett Morgan and composer Theodore Shapiro. We learn many interesting facts about the people, the art of their filmmaking and the preparation of the music. Along with that they give the listener a sense of what it means to live your life around your art, and how difficult it sometimes is to meet the Star Trek "prime objective" of non-interference with one's subject. They also talk at length about their attempts to take the non-fiction documentary structure and film it more like a fictional film, limiting the interviews and filming at a near eye-level. This film will lure you in because it is near fully successful at hiding the fact it is a documentary. The end result is a poignant metaphor for winning only by successfully overcoming obstacles with faith in self. and a dosage of common sense. Highly recommended.